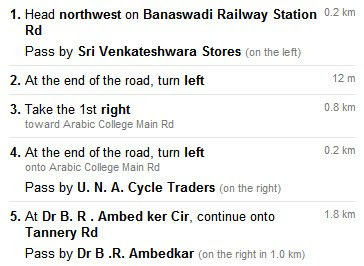 Thought Garage: Navigating Indian Roads On Google Maps With “Landmarks” : Amazing ! RouteGuru pioneered this innovation back in 2007 (http://www.pluggd.in/product-reviews/routeguru-techtribe-product-reviewhtml-435/). Please visit http://RouteGuru.com for a technology demonstration (live for Delhi-India). We use Google Maps API to (and only to) display our route on a graphical map. It can also be proved that our technology is better than Google’s. Google has just stolen the concept and formulated a great story to covey their mettle without giving any credits to us. I have no doubt, Route Guru offered this kind of service first on the internet. But what I find amazing in Google's initiative is the use of local community to provide the landmark database and then use that data to provide land-mark based directions on the pervasive Google maps. Landmark based navigation is, for sure, not RouteGuru's own innovation. The internet based service could be. But how can RouteGuru hasn't stole the whole map/directions on internet from the rest of the world, leave alone 1000s of years of landmark based navigation. Landmark collection is an independent process than identifying the existing landmarks in the Database for a meaningful direction output. Whether the landmark comes from user or from the base GIS dataset, is immaterial to the landmark generation process. Lanrmark based directions concept is surely a 1000 year old concept but the first demonstration of it's technological simulation was indeed pioneered by RouteGuru which is independent of the medium it is accessed through (Web/Mobile). If we remove the collection of data from the equation, then meaningful interpretation of GIS dataset is what all web/mobile based navigation is doing. Landmarks are just another attribute to the GIS data that are being used to either compliment or replace the normal mode of routes/directions. For instance, street views provided by Google Maps is such an extension attribute to traditional GIS data where it compliments the whole information throughout the route. The underpinning algorithms to find the route do not change, just the visual cues. Just like a Google maps based mash-up with a different type of visualization in-terms of landmarks. I definitely heard it from Route Guru first time, this kind of landmark based visual cues. And that credit goes to Route Guru, no doubt.